Yes, we really do drive a giant grocery cart. 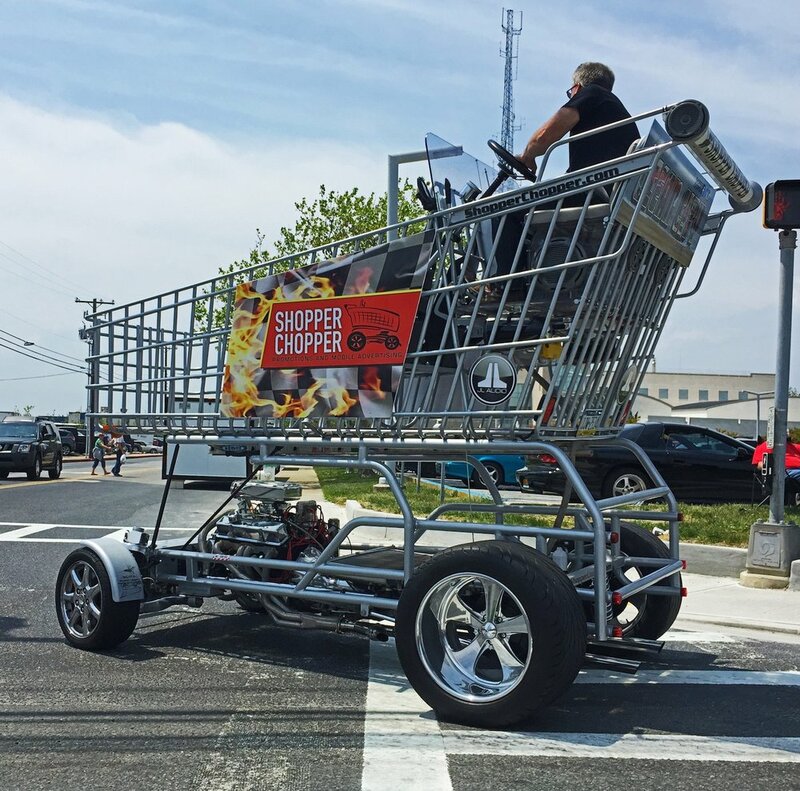 The Shopper Chopper is a ten-foot tall, street-legal, shopping cart that started out as a crazy idea by a grocery guy - and became an even crazier marketing phenomenon. We can drive on city streets with your branding message on all four sides of the “basket”. The driver sits up in the “kiddie-seat” while transporting up to five additional passengers in the basket (the seats are also removable). 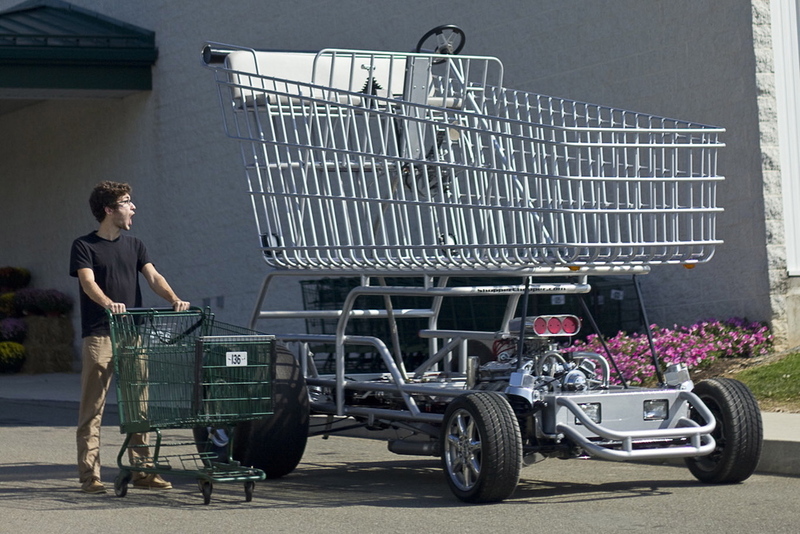 If you need a giant shopping cart for your production, we're here for you. We've been part of several television and online commercial campaigns (Jay Leno's Garage, Sundrop Soda, Harvey's Supermarkets and Paramount Home Video). We come prepared to support the production crew and have always exceed the expectation of the producers/directors. 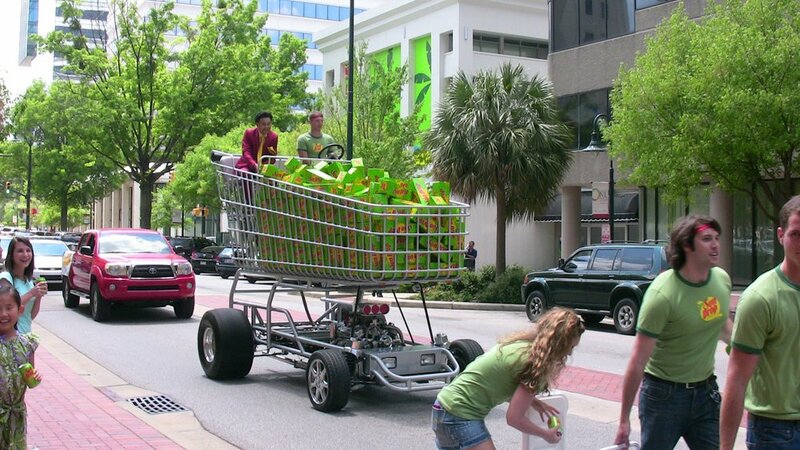 Can you really drive a grocery cart on the street? Yes. We are registered and regularly inspected. We carry commercial vehicle and liability insurance and use drivers with a commercial driver's license. All the elements required by the Commonwealth of Pennsylvania were considered and installed while we were building our crazy cart and many of those state regulations are based on Federal Motor Vehicle code, so we're legal all across the US. Can I rent it and drive it myself? Unfortunately, no. Our insurance company has very specific requirement for drivers and generally the only people who operate the Shopper Chopper are the guys who built it. Every event is different and will vary in price. The best way to get an accurate cost is to send us the specifics of what you need via our contact page and we can generate a detailed quote. Transportation is a big part of our overhead cost, so the closer you are to southeastern PA, the lower the cost. But we travel anywhere in the US and Canada. Do you donate your services for charity events? We do our best to mix charitable events with our paid promotional work. If you have a worthy cause, contact us and we'll see what we can do. But note the transport cost prevents us from venturing too far outside our local area (Lancaster/Harrisburg/Philadelphia). Bad Grandpa DVD Release Promotion @ Yankee Stadium on Sunday January 26, 2014. DVD release available in stores Tuesday 01.28.14. Our local news station profiled the builders of the cart for a Black Friday story, this clip was picked up by national new media. We were honored to be part of the 2015 Houston Art Car Parade. It was a bit cloudy, but the enthusiastic crowd kept the mood bright. Houston is the center of the Art Car universe and it was a unique experience to be part of the event (and we tied for 2nd place Art Car). The Shopper Chopper can be part of your brand. When you book the Shopper Chopper, we emblazon the front, sides and back of the basket with your store or organization's name, logo, slogan, color scheme, etc. It becomes YOUR cart. We classify events into two types: Stationary and Mobile. Mobile events are parades and promotions where the cart is moving as part of the event. Your choice of signage is added to the sides and back of the cart and we drive through any city or town getting attention for your brand. The basket of the Shopper Chopper can carry up to five passengers or be filled with mocked-up product or other promotional media. Events at night really let us show-off the LED display. Stationary events are where we transport and set-up the cart in front of your store (or IN your store) for a promotional event. Signs and/or banners with your store name, logo or slogan are placed on the basket sides and back. We also place the text of your choice on the cart "handle". Store openings, special events, product promotions, etc. For tradeshows we transport the cart and set-up at your booth location, signage of your choice is placed on the basket. Product can be placed in or around the cart - we can even mount flat panel displays to the basket. The Shopper Chopper will definitely get potential customers to stop and linger at your show booth! Note: Our crew is very safety conscience and we carry full liability and commercial vehicle insurance. 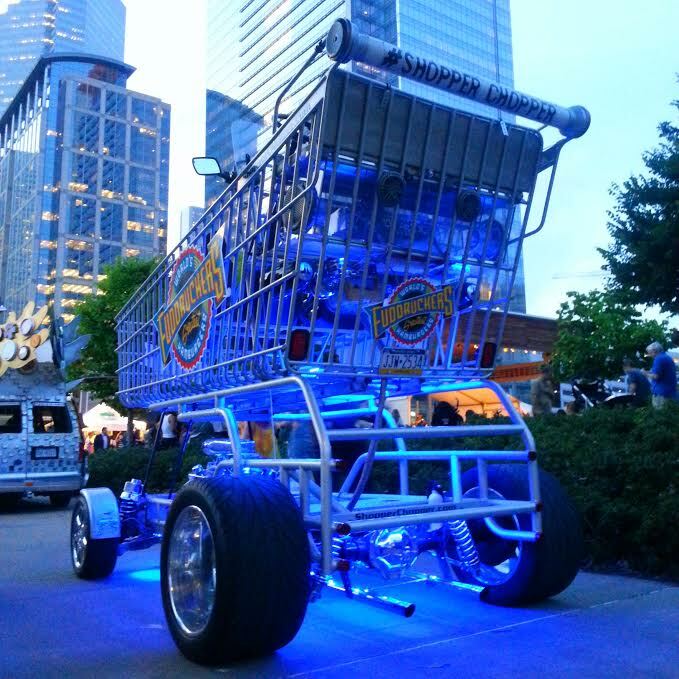 We can bring our giant shopping cart to any location in the continental United States. If there is a door 6'-2" wide and 8'-6" tall, we can bring the Shopper Chopper inside your store! 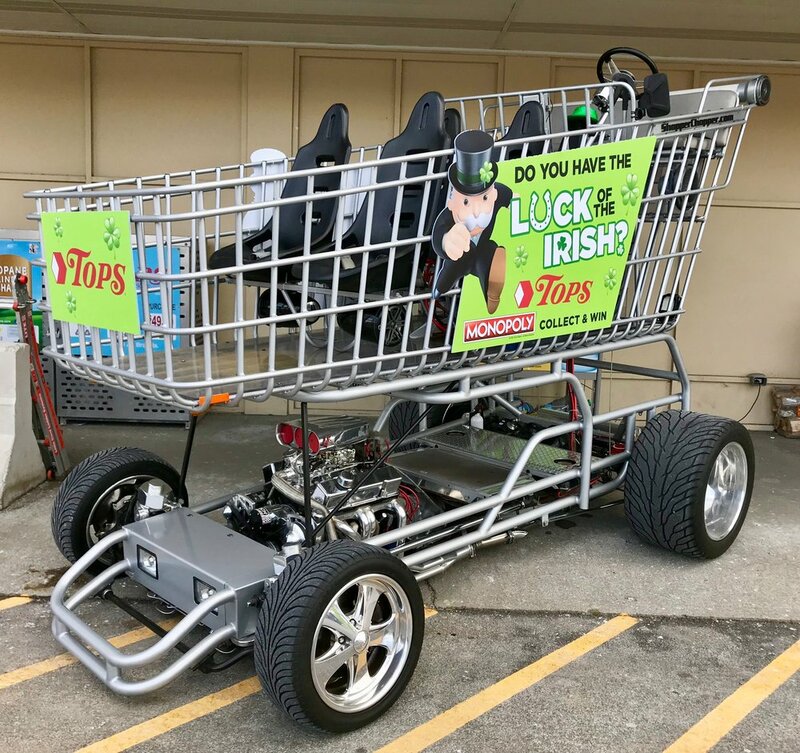 Shopper Chopper aka, Street-Legal Cart, Giant Cart, Super-sized Buggy, Uber Cart, Parade Cart, SunDrop Cart, Guy's Grocery Games Cart, Hot Rod Cart, Dragster Cart, Monster, colossal, huge, enormous, ginormous, immense. You get the idea, it's big. Our annual cold weather event with ROCK107 when we drive to all the Gerrity's Stores in Scranton for a fantastic food drive. When the Food Network launched Guy's Grocery Games, we were thrilled to be part of a Good Morning America segment. Two days of street events, launch parties and brand ambassador interaction with thousands of fans and thousands more through social media sharing. We brought our Special Sauce to Flavor Town. Once in your life, you should drive through Manhattan in grocery cart - it is truly unbelievable. 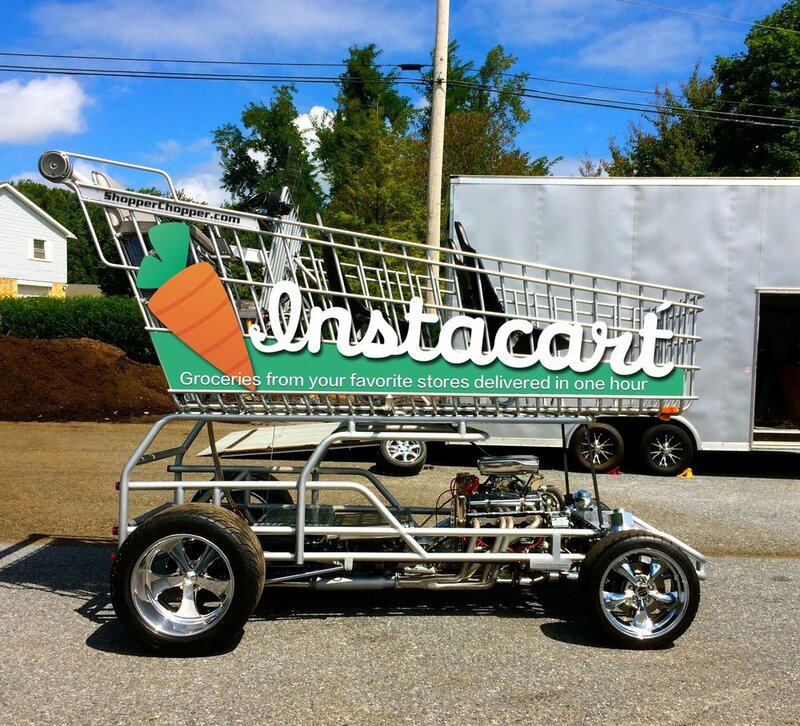 We were there for the launch of Instacart grocery delivery in Indianapolis. We drove around the greater metro area cross-promoting Instacart, Marsh Supermarkets and Petco - from local television news coverage to tailgating at a Colts game, we made a splash in Indy. Filming five commercial spots in one day! Rome Kanda, "The Taste Master", was up to the challenge - and so were we! Houston Art Car Parade Weekend. Art Car people are unique - just like us. We fit right in with the eclectic and talented people of the art car culture. And we brought some good mojo to our sponsor, Fuddruckers! Local parades for local merchants was the original business model for our company. We have grown into a very capable event marketing company working with national brands, but local parades are still some of our favorite events. Five Bad Grandpas, snow, Yankee Stadium, hockey fans and a Johnny Knoxville DVD release promotion - that is a recipe for a memorable event - executed to perfection by Shopper Chopper. We bring passion and a proven track record of successful events to every project. we will make every event the best it can be.